View or download the contest entry form. Anyone can enter, regardless of age, skill level, or place of residence. Photographs must be taken in Freedom, NH and creatively reflect the contest theme. Photographs must be the original work of the entrant. Both color and black & white photos, in landscape format only, will be considered. Photographs must have a resolution of no smaller than 1500 x 2100 pixels. Higher resolution photos are encouraged for better quality reproduction. Digitally or otherwise enhanced or altered photos will not be considered, and will be disqualified by the judges. Minor adjustments are acceptable (crop, sharpen, slight color adjustment). Entrants must respect the rights of property owners and, if possible, seek their permission. For any photo in which a person is recognizable, entrants must obtain their written permission. Entrants grant permission to FHS to use their photographs in marketing and promotion, including but not limited to, the 2016 Calendar. Entrant will be credited. A maximum of 3 photos may be entered in the contest which must be submitted in both digital and 5” x 7” print forms. Digital format can either be on CD (preferred), USB file, or JPG email attachment (bonniebnh@myfairpoint.net). Prints must be on photographic paper. Create a descriptive title for each photograph that reflects your thought process for taking and/or selecting it for the contest. A $3 fee is required for each photograph entered. 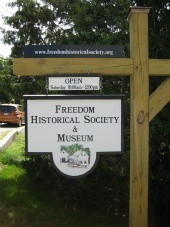 Complete the contest entry form and submit it with fees and photo entries in a sealed envelope either by mail to the Freedom Historical Society, P.O. Box 548, Freedom, NH 03836 or hand deliver to the Freedom Village Store between 10 am and 2 pm. FHS will appoint an independent panel of three judges from our community who work professionally or have significant experience in photography and art. Judges will not be permitted to enter the contest. Entries will be evaluated on the basis of how well the photograph creatively fits the theme; technical aspects such as focus, exposure, and color; compositional elements; and visual impact. Photos are not identified except by title. Each entry will receive a numerical score from each judge and scores will be combined for a total score. Based upon the score ranking of all entries, the FHS Calendar Contest Committee will determine the 13 winners. Up to 9 entries will also be selected to receive honorable mention. The 2016 Calendar Contest winners will be announced at a reception at Freedom Town Hall on June 26, 2015. The public is invited to attend and honor all of the contestants and their beautiful photo entries. The limited edition calendar, “Stone Walls of Freedom” will be available for sale. FHS appoints an independent panel of three judges who have professional experience in the visual arts and photography. All contest entries are judged on artistic representation of the contest theme; technical aspects such as focus, exposure, and color; compositional elements; and visual impact. Photos are displayed only with their descriptive title; the submitter’s name is not present. Each photo receives a score of 1 (low) to 4 (high) from each judge and scores are then combined for a total score. Based upon the score ranking of all entries, the Calendar Contest Committee determines winners and honorable mentions. Your picture, above all, needs to be in focus (unless the picture features some intentional blurriness) and sharp. Make sure your photo is properly exposed. Does the photo show pleasing color with clarity and correct exposure? Is the snow blue instead of white? Is the image faint and hard to see? Clarity and resolution of the photo mean a lot. Get creative and be artistic with the stone wall theme. Does your photo show an artistic eye? Notice the unique and the unusual, and make the most of it. Finding an interesting and original choice of subject or view, and going out on a limb, will often result in some of the best photos. The photo should be balanced in composition (for example by use of the Rule of Thirds). Are the compositional elements arranged in an eye-pleasing manner? Is there a center of interest? Does the composition draw your eye to a particular element? Move in closer if you need to. Make sure your horizon is level. Lastly, give your photo a descriptive title. It will give the judges a hint about your thought process when taking or selecting the photo for the contest. We all love a good story! For any additional questions about the contest, contact Nadine Chapman at tfichapman@gmail.com or 539-6594.